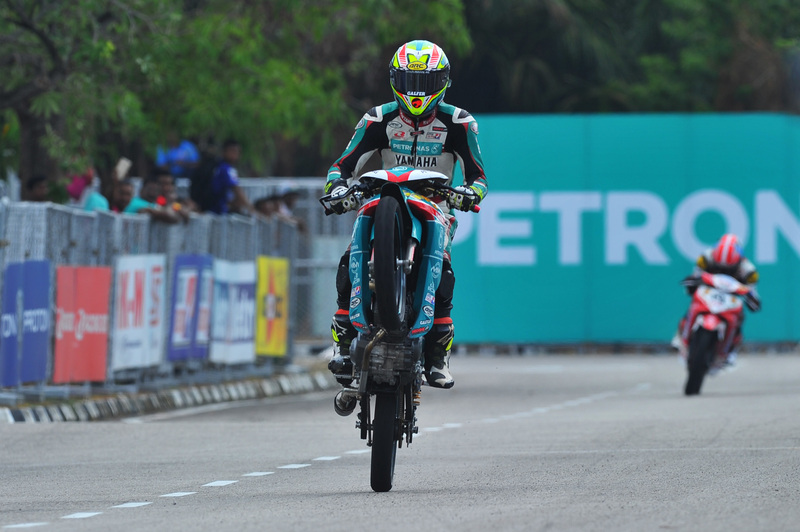 PETRONAS Yamaha Maju Motor rider Ahmad Fazli Sham created a new championship record by becoming the rider with the highest number of race wins at the Batu Kawan street circuit. The 34-year-old seasoned campaigner put up a masterful performance at the 1.265km track to win the CP130 class with a convincing 2.088s margin ahead of the rest of the field. The CP130 Final flagged off with rookies Hafiz Nor Azman and Kasma Daniel Kasmayuddin fighting for an early lead. For the first three laps, the race looked set to be a Hafiz-Kasma showdown until Lap 4 when Kasma’s bike suddenly seized up and spluttered to a stop. However, this did not give Hafiz the chance to break away. Fazli easily powered past Hafiz on Lap 5 and proceeded to carve out a significant amount of daylight between him and the chasing SCK riders. Unobstructed, Fazli raced to the finish line with a time of 16’18.041s. 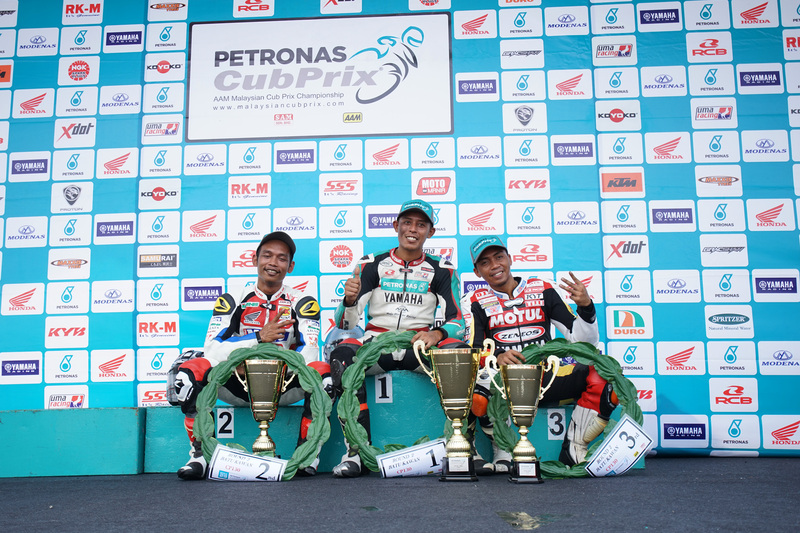 Behind the PETRONAS Yamaha Maju Motor rider, SCK duo Hafiz Nor Azman and Norizman ismail struggled to maintain their pace. Motul Zeneos Yamaha YY Pang rider Md Azhar Abd Jalil successfully narrowed the gap and was able to sneak past Hafiz’s defenses in the final lap. However, it was much harder for Azhar to bully his way past the wily Norizman. The race ended with Norizman in second place with 16’20.129s and Azhar third with 16’20.196s. “Our team’s bike was really fast at Batu Kawan. If not for Kasma’s mechanical problem, I am certain we would have taken another 1-2 finish here. Despite Hafiz’s aggressive start, I knew that he would not be able to run far ahead, but when Kasma retired on Lap 4, I couldn’t delay the overtaking move any longer. 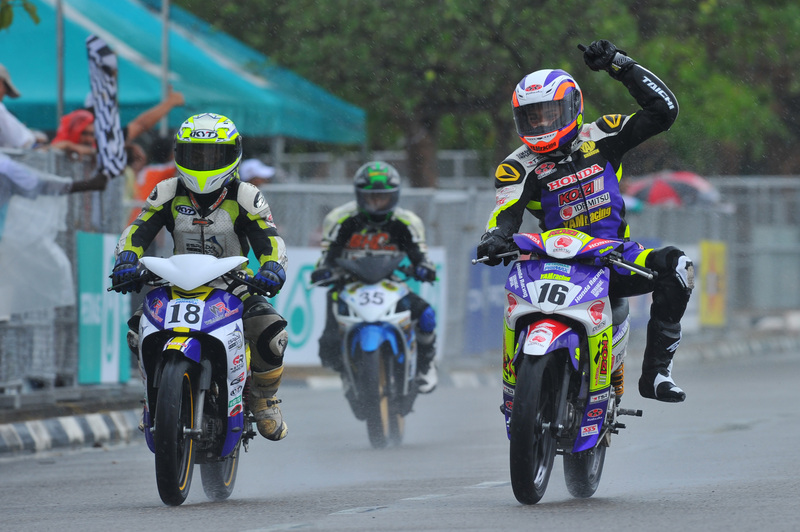 It had to be done on Lap 5 to guarantee victory for Round 2,” said Fazli of his third win at Batu Kawan. 2016 marks the 15th year in which the PETRONAS AAM Malaysian Cub Prix Championship is held at the Batu Kawan street circuit. Over the course of the decade and a half, only four riders have won more than once at this tricky circuit. These include Fazli, Norizman, Zaqhwan Zaidi and Azlan Shah Kamaruzaman. Fazli’s previous Batu Kawan wins were in 2007 and 2009. The results from Round 2 placed Fazli at the top steps of the CP130 ranking with 45 points, followed by Norizman Ismail in second overall position with 31 points. A disappointed Kasma dropped down to third overall with 25 points. In the CP115 category, Md Harith Farhan Baharin absorbed 15 laps of unrelenting pressure from Tengku Amirul Haffirudin to emerge winner with a total race time of 14’22.415s. Despite starting from pole position, Tengku Amirul Haffiruddin was denied a second consecutive win in the opening legs of the 2016 season. The Motul Zeneos Yamaha YY Pang rider was forced to settle for second position with 14’22.629s. 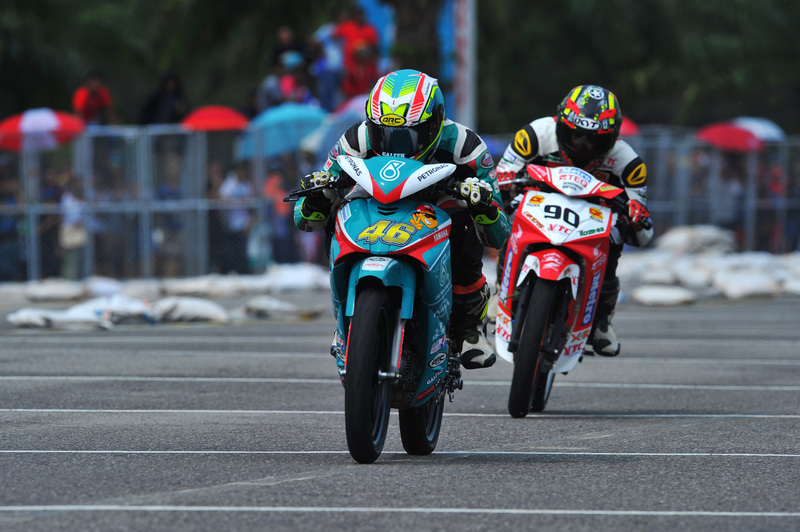 Meanwhile, privateer rider Md Haeikal Akmal Zakaria stunned the grid when he defeated riders from professional teams and crossed the chequered flag in third place with 14’32.285s. Tengku Amirul, now with 45 points to his name, retained his championship lead while Harith Farhan closes in at second overall with 41 points. Finally, a heavy downpour during the Wira Final failed to detract from an exciting performance from the junior riders. Idemitsu Kozi Yam Honda’s Md Shafiq Ezzariq who had been clocking quick times throughout the weekend, won a hard-fought 12-lap race with a time of 12’02.299s. Another privateer rider, Md Afizi Supaat, also delighted the crowd when he finished second with a time of 12’02.358s. Md Anuar Ibrahim Pawi (younger brother of Khairul Idham Pawi), lived up to the family tradition of racing excellence when he earned a spot on the podium with a third place finish. Shafiq is the unequivocal leader of the Wira class. Two consecutive victories has given Shafiq a 26-point lead on the Wira standings. Privateer S. Alif Nazirul S. Ismail and Saiful Azhary Muhamad are tied in second overall position with 24 points apiece. Round 3 of the 2016 PETRONAS AAM Malaysian Cub Prix Championship will take place in Kangar, Perlis on May 1, 2016.